We were asked to support our client, Enterprise Holdings, with their winter party for all their head office staff. We were asked to create a fabulous party space, with lighting, DJ, games and audio visual support. Our client wanted a spectacular night within a reasonable budget. They had already found themselves a great venue, through their own connections, Mercedes Benz World in Weybridge. It’s a huge space and we had to work together with our client and the venue to maximise that space, whilst keeping a close eye on that all important budget. Our biggest challenge was creating an intimate party environment inside an enormous gleaming museum space without blowing the budget out of the water! However, with a clever use of lighting, we were able to create a number of smaller areas in various parts of the building, that allowed the party-goers to dance, talk, network, play games or just chill out, all whist admiring the incredible cars on display and having a great time. To add to the evening, we arranged spectacular fire-eaters at the doors as the guests arrived; stilt-walkers greeted them inside, a DJ upstairs played the tunes and we added to the driving simulators already at the venue, with some fun games of our own. 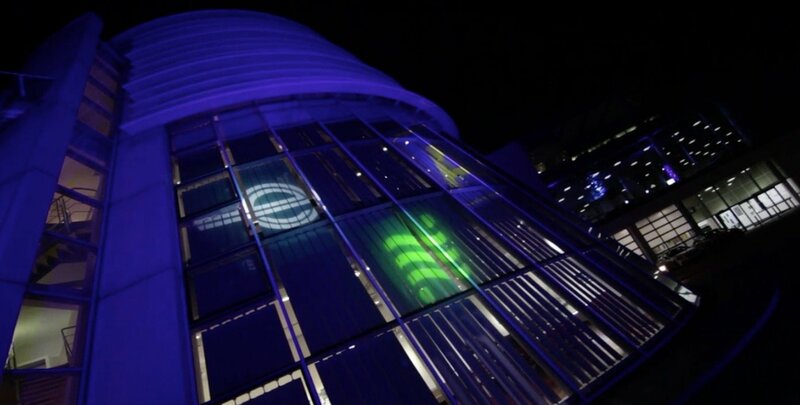 And to give the event a really special feel, we even lit up the outside of the building with the company’s logos. What a great way to say thank you to their team! The comments we received from everyone on the night are summed up nicely by Ash and Khaled on the video above.